13 Commercial Real Estate & Properties in Oxenford are listed in 4 categories. We have 5 OfficesLease , 5 Retail ShopsLease , 2 Other Commercial PropertiesLease and 1 Industrial Warehouses Lease . 211m2 indoor rec approved space 2 x 90m2 1st floor spaces All have exclusive amenities Exclusive parking spaces Extremely close to M1 These spaces won't last long, extremely competitive rates Approx Disclaimer: Ray White has not independently checked any of the information we merely pass on. We make no comment on and give no warranty as to the accuracy of the information contained in this document which does not constitute all or any part of any offer or contract by the recipient. Prospective purchasers / lessees must rely on their own enquiries and should satisfy themselves as to the truth or accuracy of all information given by their own inspections, searches, inquiries, advices or as is otherwise necessary. No duty of care is assumed by Orchid Avenue Realty trading as Ray White Surfers Paradise Commercial divisions toward the recipient with regard to the use of this information and all information given is given without responsibility. 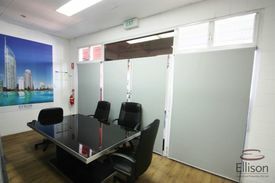 Office Located Conveniently Minutes From M1 - Don't Miss This! $710 per week + GST inclu..
145m2 office with extra balcony Multiple office spaces and boardroom 3 car spaces included Exclusive amenities including kitchenette shower Centrally located NBN network capable Approx Disclaimer: Ray White has not independently checked any of the information we merely pass on. We make no comment on and give no warranty as to the accuracy of the information contained in this document which does not constitute all or any part of any offer or contract by the recipient. Prospective purchasers / lessees must rely on their own enquiries and should satisfy themselves as to the truth or accuracy of all information given by their own inspections, searches, inquiries, advices or as is otherwise necessary. No duty of care is assumed by Orchid Avenue Realty trading as Ray White Surfers Paradise Commercial divisions toward the recipient with regard to the use of this information and all information given is given without responsibility. 99m² ground floor retail Access to grease trap loading dock to shop Suitable for food/beverage or retail Ample on site parking for customers and staff Easy access to M1 Motorway Available immediately Join the village now! Approximately Disclaimer: Ray White has not independently checked any of the information we merely pass on. We make no comment on and give no warranty as to the accuracy of the information contained in this document which does not constitute all or any part of any offer or contract by the recipient. Prospective purchasers / lessees must rely on their own enquiries and should satisfy themselves as to the truth or accuracy of all information given by their own inspections, searches, inquiries, advices or as is otherwise necessary. No duty of care is assumed by Orchid Avenue Realty trading as Ray White Surfers Paradise Commercial divisions toward the recipient with regard to the use of this information and all information given is given without responsibility. 35m2 - 69m2 Retail Shops/offices From $300/m2 + Outgoings ..
Prime Retail Shops + Offices in busy Oxenford Square Unit 10: 35m2 on Ground Floor Net rentals starting from $9,500 on offer Unit 23: 69m2 on Upper Level (no wheelchair access) Join Bank of Queensland, Fast Food and Services retailers Very generous incentives on offer for long term leases Call us today to secure this excellent long term investment before you miss out! Locally supported shopping centre with ample on site customer parking. Located close to schools and Kindergarten, M1 motorway with a large catchment area. Highly suited for a service or product to supply the large surrounding equestrian and farm interests. Shop 18 Area: 114m2 Wide inviting Glass shop frontage. Terms: 3 and 5 Year leases. Incentive: rent free or fit out contribution. Looking for: Outlet for Stock feed, equestrian and general farm products. Medical and/ or dental services. Financial services. Office for professional Services. and the list goes on. Cottonwood Plaza is located in Oxenford, one of Australia's fastest growing population areas located 21 kilometres north of Surfers Paradise and 60 kilometres south of the Brisbane CBD. The Oxenford commercial precinct features national mega retailers such as Bunnings and K Mart, supermarkets such as Woolworth and Aldi, a variety of service providers, medical super centre, child care centres, local community centre and an array of fast food outlets along with excellent access to the M1 Pacific Motorway and public transport. Furniture not included with the tenancy's. Approx Disclaimer: Ray White has not independently checked any of the information we merely pass on. We make no comment on and give no warranty as to the accuracy of the information contained in this document which does not constitute all or any part of any offer or contract by the recipient. Prospective purchasers / lessees must rely on their own enquiries and should satisfy themselves as to the truth or accuracy of all information given by their own inspections, searches, inquiries, advices or as is otherwise necessary. No duty of care is assumed by Orchid Avenue Realty trading as Ray White Surfers Paradise Commercial divisions toward the recipient with regard to the use of this information and all information given is given without responsibility. Pay No Outgoings Or Electricity! $270 + Gst Per Week Inclu..
38m2 ground floor office Outgoings included in rent Also includes water and power Air conditioned and newly tiled Ample parking available Motivated Landlord, incentives on offer approx Please contact the listing agent for more details by clicking on the link above. Disclaimer: Ray White has not independently checked any of the information we merely pass on. We make no comment on and give no warranty as to the accuracy of the information contained in this document which does not constitute all or any part of any offer or contract by the recipient. Prospective purchasers / lessees must rely on their own enquiries and should satisfy themselves as to the truth or accuracy of all information given by their own inspections, searches, inquiries, advices or as is otherwise necessary. No duty of care is assumed by Orchid Avenue Realty trading as Ray White Surfers Paradise Commercial divisions toward the recipient with regard to the use of this information and all information given is given without responsibility. Commercial Shop For Lease In Oxenford!!! $300 per square meters+ou..